A third slice of jazz prog sludge heaviness, compact and brutally single minded. 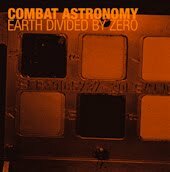 With the second album "Dreams No Longer Hesitate", the multi-instrumentalist James Huggett and his unit Combat Astronomy made a certain impression in the European counter-rock environment last year. Here, he presented an insidious and strong formula relating to the 70's Zeuhl, 80's noise, 90's doom and present time minimalist drones, mixed with free jazz of the renowned saxophonist/clarinetist Martin Archer, all topped by the confident but otherwise human voice of Elaine DiFalco from indie group Caveman Shoestore.The album then also is a continuation through strenghtening and perfecting specific aspects of the band's established sound. And it all turns out to work - moreover it exceeds all expectations. From the wordless singing and into in the bass/drums/Hammond introduction of the grim opening cut ÇAstralizedÈ, via bent poly-rhythms under coarse fuzz strings and strangely well-sounding vocal phrasing in "Parallax of One Arc Second", to the monumental three-part title track, where extreme sonic considerations develop into a chaos contract between instruments and the impulses that influence. Huggett can hardly be accused of being special delicate, he reduces almost all sound matter into an essence that he funnels the music through (a bit like Guapo, Tarantula Hawk and Yeti before him, even though none of them sounded quite like this), and the continuous components - grinding and crushing bottom drive under odd rhythm coordinates, furious free solos on top, sudden quiet breaks over equally monomanic theme motives - are not wavering an inch on this disc. Combat Astronomy's third ensemble release opens with a long haunting human call that seems to come out across a desert at night: echoing and morphing into the strange off kilter ritual of 'Astralized', a looping miasma of dubbed out horns, dervish incantations. This hypnagogic atmosphere continues throughout the disc, an eerie otherworldly aspect and restless energy that often threatens to collapse the rigid grasp the nuanced drums and de-tuned tectonic bass have over the polyrythmic structures. The lyrical narratives of its predecessor "Dreams No Longer Hesitate" are gone, and when di Falcos vocals do merge are either indecipherable or phonetic: sometimes little more than primal screams, at other times layered choruses. A continous dense wall of shifting sound, Combat Astronomy show possibly their highest level of stylistic purity so far - the sense 'otherworldly yet familiar' experience more akin to the primal landscapes of Zoviet France than the typical library references of extreme metal or free jazz. Like Tarkovsky's films, the music seems to communicate primarily with ones unconscious mind regardless of whether the conscious one is enthralled or repulsed.